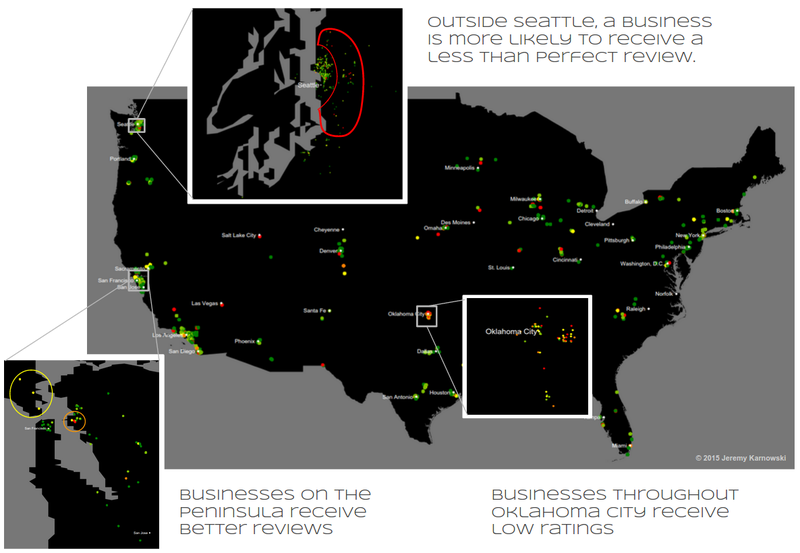 In the above image, I plotted reviews from deaffriendly.com and highlighted some interesting patterns. While qualitatively these statements seem true, the next step would be to do a more in depth study. Also, a future version of this map could look similar to Yelp’s Wordmap or the Health Facility Map which uses TZ Open Data Portal and OpenStreetMap. Why was this of interest to me? As a PhD student at UCSD, I am friends with many people who are in the Center for Research in Language and work with Carol Padden studying sign language. I participated as a Fellow in the recent CARTA Symposium on How Language Evolves and was paired with David Perlmutter (PhD advisor to Carol Padden) who presented on sign language. While I have not studied sign language in my research, the Deaf community is one that interests me and I thought I would help out if I could. In June of this year, I was the chair and organizer for the inter-Science of Learning Conference, an academic conference that brings together graduate students and postdoctoral fellows from the six NSF-Sponsored Science of Learning Centers. One of these centers is VL2 which is associated with Gallaudet University. As part of the conference, I organized interpreter services and used CLIP Interpreting as they were highly recommended by many groups (and VL2 students said they were the best interpreters they had ever had). At the end of the conference CLIP Interpreting told the VL2 students and the iSLC organizers about deaffriendly.com and encouraged us to contribute to the website. This was my chance to pay it forward. I highly recommend using deaffriendly.com and helping them expand their impact.